The 50-member South Coast Chorale rehearses Monday night, Nov. 5, at the Ernest Borgnine Theatre for the opening of its 29th season on Nov. 10 and 11. The concert, “Home”, seeks to offer hope to communities struggling with homelessness. The ensemble will be accompanied by a 14-piece orchestra and two guest soloists, Trisha Rivera and Cameron Barrett Johnson. Photo by Asia Morris. Nolan Ross Samé-Weil, a tenor with the 50-voice South Coast Choral, once identified as homeless. He felt lost, struggling with addiction and identity. “I almost died in the streets as a direct result of fear-based behavior,” he said. Growing up, Samé-Weil said he felt “different.” Identifying as LGBTQ, he felt shunned by society and by his once, loving family. Turning to drugs, alcohol and damaging relationships for refuge, he began to despise his own existence. After being in and out of rehab for 14 years, “I asked God to help me… and ended up in rehab one last time,” he said. Now three years clean and sober, he has a roof over his head, is happily married and thinking about starting a family; and the family who once rejected his identity, now accepts Samé-Weil for all that he is. Samé-Weil said he couldn’t have made it this far without those who helped him recover and he hopes SCC’s upcoming concert, “Home,” will inspire a deeper understanding of others who are struggling with homelessness. 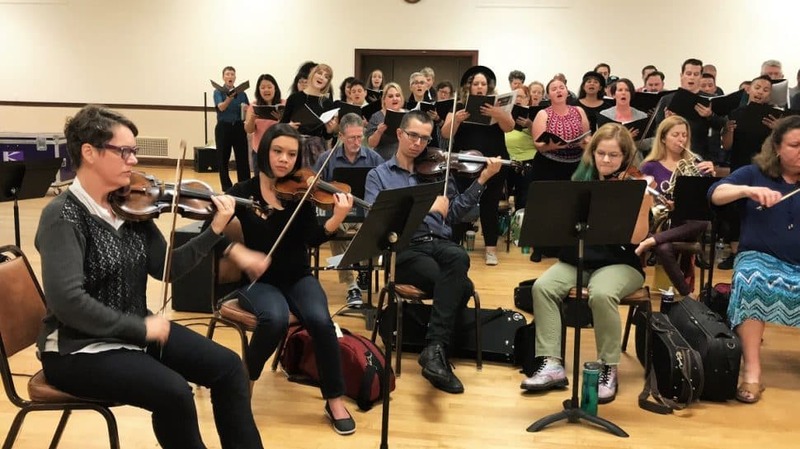 South Coast Chorale and accompanying 14-piece orchestra rehearses before “Home,” the group’s opening concert for its 29th season and a tribute to those experiencing homelessness. Photo by Asia Morris. 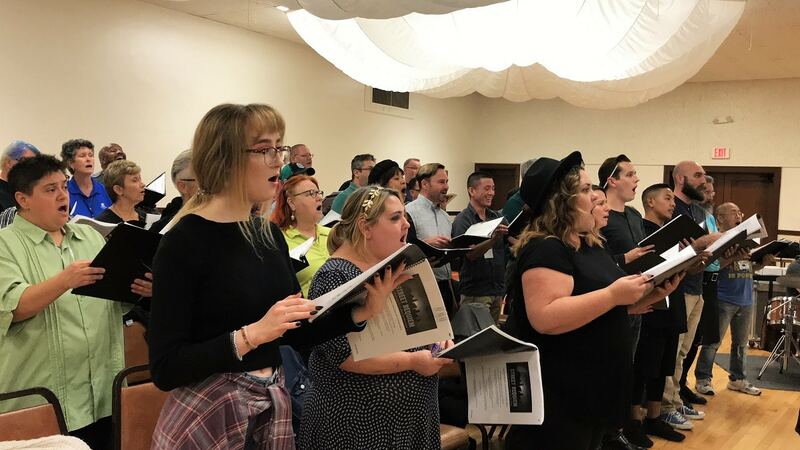 South Coast Chorale, known fondly as the LGBT Chorus of Long Beach, opens its 29th season with “Home,” which members view as more than an entertaining program, but a musical tribute in support of Long Beach’s homeless community. “Home,” opens Saturday, Nov. 10, and features the SoCal premiere of Street Requiem: for those who have lived and died on the street by Australian composers Kathleen McGuire, Andy Payne and Jonathon Welch. It’s a contemporary choral work with multiple movements—some heartfelt remembrances of lives lost, some more uplifting—seeking to offer hope to communities struggling with homelessness. “We cannot even dream to succeed in our fight for acceptance if we don’t also support, encourage and fight for other communities who experience struggles of their own,” said SCC’s artistic director Chris Smith. Los Angeles County may have seen a dip in its overall homeless population, but two vulnerable segments, youth and seniors, saw an increase, according to the L.A. County Homeless Count. Long Beach has its own struggles with homelessness, including a recent march to “take back Belmont Shore” which many saw as an affront to the many homeless that frequent the affluent corridor. SCC artistic director Chris Smith guides the 50-voice ensemble during a rehearsal for “Home”, SCC’s season-opening concert and a benefit to those experiencing homelessness. Photo by Asia Morris. While SCC is based in the LGBTQ community, the group is committed to pushing for equality and inclusion for all people, said Smith. It’s estimated that as many as 40 percent of homeless youth in America identify as LGBT. 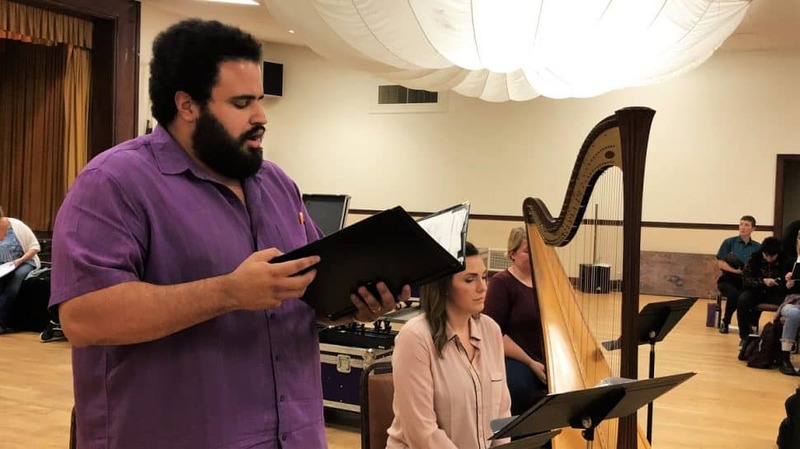 Mari Castillo-Hansen, a soprano with SCC, said that the eighth part of Street Requiem that they rehearsed, “Gloria-Anthem of Empowerment” was her favorite because it challenges the idea that a requiem has to be about death and sadness. “Even though we may not know many of the stories of those who died on the street, we can still celebrate those lost lives, remember them and hopefully learn to do better by others,” she said. Street Requiem, which premiered at the Melbourne Recital Centre in 2014, is described as a contemporary twist on a traditional requiem and is intended to offer a spiritual experience—without being secular or religious—to those who hear it. Songs include English, African and Arabic lyrics, with its 11 movements taking notes from gospel, Celtic, neo-Romantic, neo-Baroque, indigenous and contemporary genres. Before SCC and the accompanying 14-piece orchestra performs Street Requiem, the audience will hear an introductory set of songs that aims to encourage compassion. 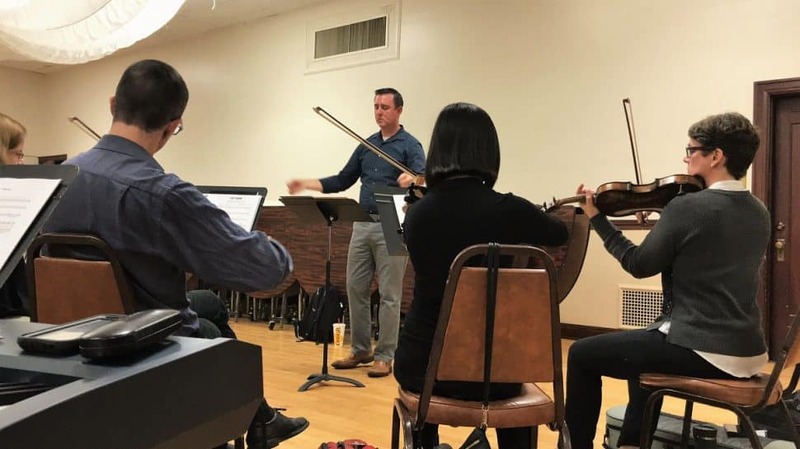 The chorale and orchestra will be joined by two guest soloists, Trisha Rivera and Cameron Barrett Johnson, during the second half of the concert for Street Requiem. Guest soloist Cameron Barrett Johnson sings during rehearsal Monday, Nov. 5. Photo by Asia Morris. A portion of the proceeds from each ticket purchased will be donated to local organizations committed to helping the homeless community, including the LGBTQ Center of Long Beach. Attendees are also encouraged to bring food, clothing and personal grooming products to donate, which will be collected in the lobby. Tickets start at $30 and are available on SCC’s website here, where you can also learn more about the ensemble’s history. “Home” takes place Saturday, Nov. 10 at 7:30 p.m. and Sunday, Nov. 11 at 2:30 p.m. at the Ernest Borgnine Theatre, located at 855 Elm Ave.